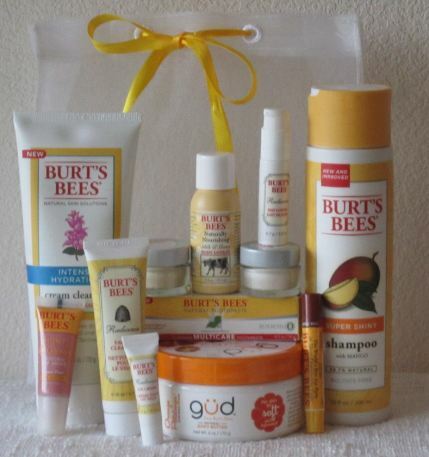 Up for grabs today is this wonderful assortment of Burt’s Bees Products. There are quite a few full size products and some samples too, perfect for sharing or spoiling just yourself ;-)! Whether you are a Burt’s Bees fan, just wanting to try their products, or need some great gifts, there is a nice range of items from shampoo to lip gloss. *This is not a sponsored contest, prize is being provided by TotallyTarget. Oooh my daughter received some Burts Bees items for Christmas and I loved trying them. Would love some of my own! Great giveaway! Love their chapstick. Awesome giveaway and products 🙂 thanks Kerry! Awesome I would love to try some if this. Love me some Burt’s Bees. Hope to win!! would love to win one! thanks! I’d love to win! Love BB! Santa didn’t bring me what I wanted for Christmas…maybe this will do! Love Burt’s Bees, thanks for the chance to win such a great gift basket! I would love to win this, just love these products. I never win anything!! Burt’s Bees have great products! Please enter me! Sweet giveaway! I love Burts Bees. Thanks for the giveaway. WOW I need this sooooo badly. What a fun giveaway! Love Burt’s Bees! I so so want this. Thanks for the awesome give away Totally Target! woo hoo!!! !……love some bert’s bees! Great giveaway! Thanks for the chance to win! Love what you do TT. I love Burt’s Bees products!! Love totally target and Burt’s Bees! Thanks for the chance to win. I’ve been wanting to try the Gud lotion! I appreciate the giveaways! Thanks!